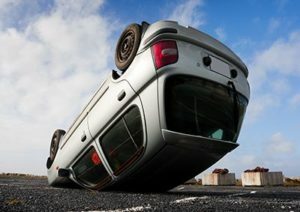 Rollover Accidents Can be Complicated | Green Law Firm, P.C. Rollover accidents can be complicated due to the fact that forces aside from driver error may come into play and it can be necessary to make a definitive determination regarding the actual cause of the accident. The majority of rollover accidents happen in an SUV or a fifteen-passenger van because both of these vehicles have a very high center of gravity, making them extremely top-heavy. When looking at rollover statistics concerning SUVs in particular, as many as half of all SUV deaths occur because of a rollover accident. According to government reports, about 40% of all fatal rollover accidents involve excessive speed. When a driver nears a sudden or sharp curve going at an excessive speed, the inertia forces can pull the vehicle in the opposite direction, causing the vehicle to roll over. SUVs are notorious for rollover accidents because of their design. In particular, Ford Explorers, Suzuki Samurais, Jeep CJs, and Izuzu Troopers are all more likely to experience rollover accidents when traveling at excessive speeds. In some instances, an SUV rollover could be caused by defective vehicle parts rather than any type of driver error. Faulty brakes or tires or even a steering column which has loosened, could cause a potentially tragic accident. While wearing a seatbelt is required by law, and seatbelts absolutely keep passengers safe during an accident, seatbelts can malfunction, allowing the passengers in an SUV rollover to be ejected. If your SUV rollover accident was caused by a defective vehicle part, you not only need a personal injury attorney, you need one who is highly skilled in defective product liability. In some cases, rollover accidents can be caused by reckless and erratic drivers on the road. When other drivers swerve out of their lane or are driving recklessly, it can cause dangerous and deadly rollover accidents – especially when the vehicles veer off of the road. No matter the cause of your SUV rollover, you must contact a highly experienced attorney as soon as possible following the accident. It is likely that independent experts, including accident re-constructionists or mechanical experts, may need to be brought in to determine the precise cause of your accident. Contact the experienced Colorado Springs car accident attorneys at the Green Law Firm today to schedule a no-obligation consultation and discuss your case. Call us today at 1-719-694-8515.